It appears that Linux Tycoon, "the world's premier 'Linux Distribution Building Simulation Game'," will be gaining online play soon, and (more importantly) is officially headed for Android (and iOS). In a blog post earlier today, Lunduke announced both of these exciting developments, and explained just how the game's new online capabilities will work: the mind behind "the nerdiest MMO ever conceived" will be releasing Linux Tycoon Server, allowing players to run their own "world" for online play separate from the official server, and also allowing for customization of the play experience including gameplay settings and Package lists. Players on all platforms will be able to join these "worlds," competing globally against other Linux Distros in real-time. 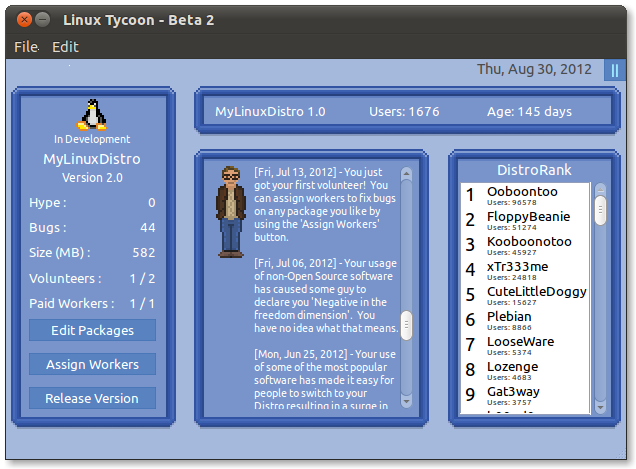 Of course, Linux Tycoon will still offer the option of single-player offline play. As an added bonus, those who purchase Linux Tycoon Beta will be given a free copy of the Android version when it hits the market (which is expected to happen in about 2 weeks). For more information, check out the source link below.